Publishers often refer to prohibited copying as “piracy.” In this way, they imply that illegal copying is ethically equivalent to attacking ships on the high seas, kidnapping and murdering the people on them. Copyright apologists often use words like “stolen” and “theft” to describe copyright infringement. At the same time, they ask us to treat the legal system as an authority on ethics: if copying is forbidden, it must be wrong. So it is pertinent to mention that the legal system—at least in the US—rejects the idea that copyright infringement is “theft.” Copyright apologists are making an appeal to authority … and misrepresenting what authority says. Recently I’ve been doing a lot of thinking about copy protection and unauthorized downloading of video content. I saw unauthorized instead of illegal because I believe that, using common sense principals, it is easy to see that this should not be an illegal process in some circumstances. My arguments in this post hinge on ethical and logical assessments of the situation, not legal arguments in any way shape or form. IANAL (I am not a lawyer) so don’t use the opinions of this post to legally justify your actions. I do encourage you, however, to use them to try and persuade our leaders that the rules need to change. 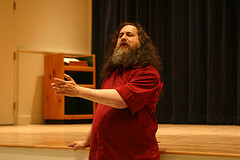 Quickly, to comment on why I chose the above quotes by rms. I think, as he does, (and all politicians) that the words we use to describe things end up framing the debate. When downloading of videos is called “stealing” it’s easy to get behind Hollywood’s side. After all, who is for stealing? No one. I say that stealing requires the taking of some object and denying its use to others. This is a good definition, right? If I steal your bike, you can no longer use your bike for riding. If I steal your car, you cannot get around any more. If I steal your money, you may be unable to buy the things you need to sustain yourself. However, if I download video content, who is being denied the ability to watch it? In fact, with digital media, copying is the opposite of stealing. As objects are copied, they are seen by more and more people. So, when should you be ethically in the clear when it comes to sharing video content? I feel that anything being shown on network Tv should be legal for me to download; it’s certainly ethical to do so. Why? Because any show I can watch on network Tv is available 100% free. If I have a Tv and an antenna I can get those channels. If I don’t have to pay for them in the first place, then how can it be stealing if I download it? That would be like saying that if I used a free public wireless access point with a PDA instead of a computer that I’m stealing the network. I find it impossible and an utter failure of logic to say that anything that’s FREE can be stolen. There should be no limitations on the way I obtain free things. Now you might bring up one of the favorite arguments of the copyright owners, “Network television isn’t free! It’s paid for by commercials! And the Tv programs you download do not have commercials.” That would be a fine argument, if there were any way to actually force me to watch commercials. It could be an infringement upon my rights as an American to force me to watch commercials. Who says I can’t use commercial time to use the restroom or flip channels? Do they expect us to watch the commercials and then go to the bathroom during the content we are actually tuning in to watch? I have to admit that I rarely ever watch commercials, thanks to my wife. She hates commercials so much that she gets antsy if I don’t let her flip through the channels. It’s the same with newspapers, magazines and anything else subsidized by advertisements – I don’t look at them. (And no one can make me!) And if I could be forced to view them, no one can force me to pay attention. Because, if they can do that, then I’m getting the hell out of this country. One more thing on the issue of commercials. I can always get a VHS tape or computer and do what I used to do as a kid – hit pause during commercials and start recording after the commercials. I never recorded commercials as a kid. And, since I can record Tv without commercials, what does it matter if someone else has done the recording for me? So now we move to cable television. When it comes to cable Tv, I argue that I have an even stronger case to be allowed to download the content – I’m actually paying for it. Not only am I paying for the programs I watch, but I’m also paying for thousands that I don’t. In fact, since I pretty much only watch Scrubs, The Office, and The Daily Show, I’m already paying for tons of shows I don’t even watch. Plus, all of these except for the premium channels are also paid for by advertising. They are already paid (sunk cost) and, as I said before, there’s no way to force me to watch commercials. When it comes the the premium channels, I’m paying a premium to watch it, so I think I should have premium rights to download this content. The ethical parts comes in that I should only ethically download shows that play on channels which I am subscribed to. I would not see the content on the ones I’m not paying for, so I don’t have the right to watch them. This brings me to my next topic, what should I not ethically download. I should not ethically download any movies still showing in the theaters and not yet showing on Tv. There is no way for me to watch this content other than going to a theater, so therefore, there is no logical or ethical reason that I should be allowed to download those movies. Once they show on Tv, I should be able to download them. As I mentioned above, we’ve always had the right to use VCRs to time shift programs. What logical difference does it make if I’m using a VCR, TiVo, or downloaded content to the the time shifting? Think about it – there’s NO difference! What it all comes down to is control. The video companies don’t like the idea of not being in control. They don’t like the fact that Europeans can download American shows while they’re still showing in America. Why that artificial system is still in place, I have no idea. They simply have not joined the technology era. People of my age group do not want to be inconvenienced by bull crap. If there’s a real, logical reason why something can’t be done, then we accept it. But, given today’s digital world, there’s no reason why I can’t watch all the stuff they produce in Britain, Spain, or any other country whose language I can understand. If they truly need the advertising money, then just move to a James Bond model for all video content. Have companies subsidize the cost of the show by paying to have the characters wear/use their products. Then, it won’t matter if they view it on Tv or off of the internet, they’ll have to see the products being advertised. AND, here’s why I don’t logically understand why they don’t do this. Right now video producers have absolutely no idea how many people watch a Tv show. All they know is what Nielsen Families watch. And they are occasionally wrong. For example, shows like Family Guy that apparently tested negatively or they wouldn’t have canceled it. Then they suddenly realized that a ton of college students and other people loved it. If their products were watched on computers, it would be a trivial task for them to count up how many people were watching the show. So they’d be able to accurately charge advertisers based on how many people were seeing the products advertised. Of course, there is one other issue. That is the fact that, at any time, a friend of mine could come over with a DVD or VHS tape of some Tv show and I can watch it with him. This cost me nothing and it may convert me to a fan. Thanks to my brother bringing over The Office for me to watch, I’m now watching it on NBC. Would it not, ethically and rationally, have been the same thing if I had downloaded the first few seasons and then liked it so much that I now watch it on NBC? I think if you answer honestly, you’ll see that I’m right. Yet, the Tv and movie producers are trying to make it more and more so that stuff you buy only plays in your house. I can tell you for a fact that if I would have had to go to my brother’s place to watch The Office I would not be a fan today. There was just too much inertia working against me going to his place. I would like to address one final issue which I also feel exactly the same way about when it comes to music. For those who cry of the apocalypse whenever someone talks of downloadable content (meaning that if everyone downloaded then the Tv and movie studios would go out of business), I have this to say to you. First of all, that’s false for the reason I outlined above – just adapt and build the commercial into the video content. But even if it did implode, I could not care less. Look at the FOSS software movement. While it is true that today a small to medium portion of developers are paid by companies to do the work, a lot of the key work for the first 20 years of the movement was done by volunteers. And look at the amazing things they created – the Apache web server which runs approximately half of the internet, the Linux kernel, countless programs which run on Linux and other platforms, Firefox – the list goes on and on. Similarly, I’ve seen a lot of amazing videos and Tv shows on the internet. Sure, there’s a lot of crap out there – monumental amounts. But I also believe there’s a lot of crap on Tv (otherwise I’d watch more than 4-5 shows). There are a fair degree of people out there with talent who simply do video work in their spare time. For some great examples, check out this work by ReMyyyx. It might not be your cup of tea, but there’s more out there like this, this, and this. I hope I’ve helped you see past the MAFIAA rhetoric and helped you see things through the logical and ethical point of view. Please share this with as many people as possible and even send it to your elected representatives to see if we can knock some sense into them. Leave comments, I’d love to hear what others think. They are moderated, so it may take a while to appear.